Well, I went a few hours over (shame) but I finally finished my twentieth album-a-day. 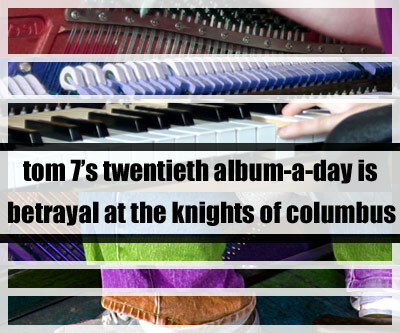 It's called Betrayal at the Knights of Columbus. One of the best ways to cure a case of musical constipation is to do a totally balls-out recording; here I am doing that in many ways: by picking some of the stupidest sounding MIDI patches that I have access to, by singing about websites, by using my first take as often as possible, and by writing songs about Pittsburgh and things on my desk. I think that the results are positive, but I may be too delirious to tell right now. Thanks everybody for the song title suggestions. These must be the longest songs in Tom7 history! Amazing. I'm only on track 4, but everything sounds great so far. I like the (more than normal) variety of production. They are kinda long aren't they? Thanks! Do you ever listen to the Mountain Goats? PS. Your fan club in Chicago is rocking hard to the new album. Mountain Goats is one of those bands that I know I like (I have heard one record by him (it's just one guy, right?)) but don't listen to regularly. Should I take that as another recommendation? If you win the Princess of Justice website theme song contest, I want 50% as a finders fee. I'm not sure how you'll split the ipod nano, but I'll leave that to you to figure out. That song was one of my favorites to make, though. So how did you make the huffy heavy drums on "Spring Break Pittsburgh 2006 wooo"? Those are sound effects from my MIDI module; I think they are "punch" and "car stop." I am usually playing them very low or cut off so they don't sound like the (also very stupid) originals much. Great work ... I really like it! I'm a fan of the first two, and princess of justince and the guitar work on self life and nothing day and the opening of GRAS -- so funny! A hearty Mountain Goats recommendation. If you like your music, I'd bet you'd like John Darnielle's a lot. (The latest 3 or so (more official) albums are a lot different than the older ones.) There's also a great wikipedia article on his band, naturally. Yeah I just edited that very Wikipedia article right after I read your first post, in fact. "If you like your music," hah. I will get on this forthwith, though I amazingly have a bit of a backlog currently. That might be the first time that's ever happened since when I was spending $100 a week on CDs in college. Thanks for the other comments, guys / you're welcome for making it; it was fun! Also, I appreciate hearing favorites, since I want to sometime put together an "AAD sessions" album of the best songs, which people might actually want to listen to. Yeah you definitely should make a best-of! Speaking of that kind of stuff, do you have any specific mixing & mastering tools or techniques? Your music always sounds near-professional in that regard (at least that's how I hear it). Jonathan: tee-hee, thanks! I'm glad Japan On Mad is interesting; it was the last song that I recorded, and at the time I actually thought of it as a throwaway song. I kind of like it now. Adhesion: It is very funny to hear that comment. I usually think of my production as being pretty lo-fi (maybe "sloppy mid-fi" is more accurate; see http://www.popmatters.com/music/interviews/vanderslice-john-051014.shtml), like nowhere near as careful as when I record with Sophia or how I know people are in studios. I think my basic idea is to set things up so that the failure modes are good; for instance, if I get too loud there should be some nice analog distortion rather than digital clipping. (So I like to put two analog preamps in sequence and only tweak the levels on the first one.) And then just go for it. Also, it's possible that you're just hearing the dynamic compression (which I apply liberally), something that is ubiquitous in popular recordings and which I cannot get enough of. It makes vocals in particular sound "louder." Yeah, I had a feeling it was just a lot of compression (I was specifically thinking about how the vocals sit nicely on top of the mix). Any specific advice about compression in particular? You do, after all, know how to set the parameters. Especially the 'release'. LOL. No particular advice, except that compression sound bad on guitar, and I like to turn the vox up Loud. I generally use the default settings in VSTDynamics (so the thing about release is a bit of hyperbole), but increase the ratio to like 4:1 and makeupgain to 9 or 10 dB. Softclip and limiter on the entire mix, to help with the "failure mode" issue. Also, another piece of simple advice is to eq the various tracks differently, since the ear is best at distinguishing sounds at different frequencies. This will result in a less muddled mix. Okay, thanks. I already do a little bit of that, like throwing the softclip on the whole mix (wasn't sure about the limiter though - what exactly is the difference between the two?). I think one of the problems that pops up a lot in my music is that it's usually pretty complex, so that requires a lot more mixing work and tweaking so that the instruments are all clear and don't clash too much. Yeah, I agree that your recordings have sounded quite good these days. I think that you get a very good balance of spending just enough careful prep time to make things sound substantially better than if you were completely careless about it. I don't think that most applications will automatically limit your final audio output if it goes over 1.0. Most will just clip the output, I think, unless you set something up to limit the output. Do you think the limiter in VSTDynamics (or equivalent) does something other than just clip? Like simulate the sound of an analog limiter? I guess I don't really know, but I assumed they just clipped. Limiter is designed to ensure that the output level never exceeds a certain set output level, to avoid clipping in following devices. Conventional limiters usually require very accurate setting up of the attack and release parameters, to totally avoid the possibility of the output level going beyond the set threshold level. Limiter adjusts and optimizes these parameters automatically, according to the audio material. You can also adjust the Release parameter manually. This setting determines the maximum output level. Signal levels above the set threshold are affected, but signal levels below are left unaffected. This parameter sets the amount of time it takes for the gain to return to its original level when the signal drops below the threshold level. If the "Auto" button is activated, Limiter will automatically find an optimal release setting that varies depending on the audio material." Soft Clip is designed to ensure that the output level never exceeds 0dB, like a limiter. Soft Clip, however, acts differently compared to a conventional limiter. When the signal level exceeds -6dB, SoftClip starts limiting (or clipping) the signal "softly", at the same time generating harmonics which add a warm, tubelike characteristic to the audio material. Soft Clip is simplicity itself to use as it has no control parameters. The meter indicates the input signal level, and thus the amount of "softclipping". Levels in the green area (weaker than -6dB) are unaffected, while levels in the yellow-orange-red area indicate the degree of "softclipping". The deep red meter area to the right indicates input levels higher than 0dB. Avoid feeding Soft Clip with excessively high signal levels as audible distortion may occur, although the output level will never exceed 0dB." OK, so limiter is better than clipping, but unnecessary if softclip is on. Heh, I'm glad that you appreciate the fact that I will "pan an album [I] actually don't like." Some of my friends sometimes say that I am a music snob or a fashion snob (neither of which I will really deny) because I will tell people when I dislike their music or outfits (probably other things too, but those seem to come up the most I guess), but I always say that I think it winds up a positive thing cuz then people know that I really mean it when I give folks compliments (and I hope I give more compliments than critiques). Anyway, my opinion on your newest AAD: Really I quite like it a lot. I pretty much actively like almost every song. There are only two that I think aren't so great (Brain Coral and Japan On Mad), but even those I don't really mind, I just am not terribly into them. As for the rest, I like all of them very well, and especially like Self Life and Nothing Day, and extra especially love Spring Break Pittsburgh 2006 wooo, and then super great ultimate for me is Princess Of Justice! I liked Brain Coral for adding to my "songs that mention chemistry" playlist. But what is a chemistry parade, anyway? It sounds like fun. But it's just an ordinary chemistry parade. any thoughts on the mountain goats? also was wondering if you're already into Stephin Merritt (&c) or if he's a revolution that will occur later in life for you. Stephin Merritt is great. I don't think that he's been as good since 69 love songs, but it hardly matters since that album is huge and wonderful. We also hosted MF at CMU touring behind 69LS, which was one of the best shows I've been to. I absolutely love this album. You guys are amazing!! PS ....Thanx alot also for your and Sophia's work on the free Au and vst plugins . Mucho Gracias. I use them all the time in my productions . Heh. Well I agree on the first few, though, they have a special place in my heart (and an occasional gem). I'm glad you stuck it through to this one! And thank you for the kind words about the album and the plugins! 1. The gratuitousish swearing in Spring Break Pittsburgh 2006 wooo. I know most people don't mind or actively enjoy swearing. But I am prudish and can't help cringing when an otherwise amicable song has swears apparently for the sake of having swears. (This is part of the reason I have avoided Jonathan Coulton somewhat.) Songs like Shithope are somehow okay for me, maybe because the swear is woven into the fabric of the song, not apparently added as a shocking embellishment. 2. I've had it up to here with "princess in another castle" jokes, and the general co-opting of retro games for amusement purposes. Generalized Super Mario Bros. Is NP-Complete is a notable exception to this because it is a masterpiece. Of course, having said all that, I still think your songs are max-awesome and it is hard to come up with any criticisms at all when you're clearly doing all of this out of a pure drive to be creative. Well, on #2 fair enough. The title/topic was forced by the contest I was entering. If it were just a naked reference I wouldn't defend it (indeed I think pop culture references are highly overrated in terms of intrinsic humor/cleverness), but the point of that line is to set up for the "gonna have to hold" and "browser is too old" variations, which I do think are clever. Obviously YMMV.